I was born in Uganda and spent the first 10 years of my life in Malawi. I called this place home. Some of my heart and soul live in the soil of this amazing troubled land. The IDAI cyclone made landfall on Friday 15th March and has completely devastated whole regions of Mozambique, Zimbabwe and Malawi. More than 2.6 million people are affected and in need of immediate assistance, with potentially thousands of lives lost and many more homes and livelihoods completely destroyed. Many lives are still at risk, as heavy winds and rains, flash flooding and mudslides continue in the wake of the cyclone. The scale of the devastation is as yet unknown. Some areas are completely cut off due to flooding, many regions are entirely without power, food or clean water and almost every communications network has been damaged. All proceeds from this pattern will go to ActionAid. 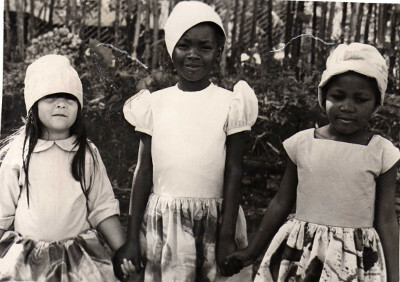 Me (5 years old) in Malawi with two little friends. We are wearing my mother's designs, created out of special printed fabric for a Fashion Show hosted by my mother for President Banda. Step-Up can be worn in various ways; hanging with the ‘steps’ in front, wrapped around your neck (with the triangle section hanging in front) or just loosely around your shoulders. The reversible purl ‘lace’ pattern is bordered by garter stitch bands. The steps add interest and shape to the shawl. Light and charming - Step Up can be dressed up or down – an easy-to-work project in one skein of 4ply yarn. yo: yarn over, starting at front of work pass yarn over needle to back. When you reach a yo on next row, k as directed. This should create a hole. Block (important if you want your garment to hang correctly); wet and lie flat on a towel - pull out to define shape. Being bold enough to work with a very loose gauge is beneficial. What may seem like ‘over-cooked noodles’ on your needles will, after blocking, produce a light and airy fabric, good for trapping air and warmth without bulk.